Spring has sprung! Flowers are blooming and trees are budding. And for many, the desire for braised meats and comfort food wanes making way for lighter, fresher and easy to prepare meals. With our desire to eat a little lighter and fresher, comes our desire to use our fruity and citrusy balsamic vinegars, and one of our favorites and most versatile is the Sicilian Lemon White Balsamic Vinegar. This vinegar is a nice balance of sweet and tangy that greatly enhances a lot of dishes from meat to vegetables. Salad dressing– Prepare a basic vinaigrette with 3 parts oil and 1 part vinegar. The Sicilian Lemon White Balsamic Vinegar pairs beautifully with a variety our infused olive oils including Basil, Blood Orange, Rosemary, Tuscan Herb and for some spice, Chipotle. For a super simple salad, try drizzling baby arugula with a little olive oil and Sicilian Lemon White Balsamic Vinegar. Add some grilled chicken and you have dinner! Marinade – Mix equal parts of Sicilian Lemon White Balsamic Vinegar and olive oil (Try Milanese Gremolata, Butter or Garlic infused oils for extra flavor), ½ tsp salt, ¼ tsp pepper and 2 T chopped flat leaf parsley. This is a great marinade for chicken or white fish such as tilapia. 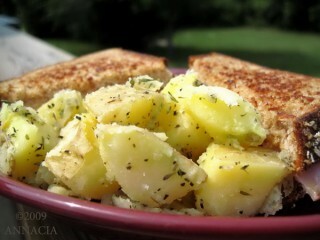 Twist on potato salad – Rather than making a mayonnaise based potato salad, try making a vinegar based one. Combine ingredients and pour over diced, cooked and still warm red potatoes. Enjoy at room temperature or chilled. Asparagus Salad – We were inspired by a Jumbo Asparagus salad served at Century House in downtown Woodstock, but we put a Leaning Ladder spin on it. Using a non-stick pan, heat the olive oil over medium high heat. Add asparagus and saute until tender, approximately 3 minutes. Remove from the heat. Prepare a sunny-side egg. 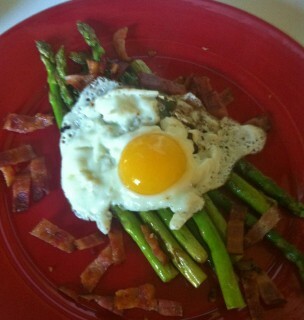 Plate the asparagus, sprinkle bacon around the asparagus and add the sunny-side egg to the top of the asparagus. Salt and pepper to taste and drizzle Sicilian Lemon White Balsamic Vinegar over the top. The sweet and tangy vinegar mixes with the rich egg yolk to make a delicious and satisfying sauce for the asparagus and bacon. Great for a leisurely breakfast or add a bed of spicy baby arugula for a simple and light dinner. One vinegar, five (plus more) ways to use! Enjoy!